The Hotel Tahiti Playa is a hotel located in the Tahiti Playa complex, offering rooms with up to 60 sqft. of area. Guests can enjoy a luxury holiday in this four-star resort that has swimming pools for adults and children, an outdoor Jacuzzi and a buffet restaurant that serves various cuisines from around the world. There are also several bars where you can listen to live music, dance, have a drink, or a coffee. A large banquet hall in the hotel allows for the celebration of large events, parties, etc. There is also a space with seating area and television and pool tables. This hotel has a massage and hairdressing service. Children can enjoy activities that are scheduled by the ‘kids club.’ Adults too can sign up for workshops and other specific activities. Hotel Tahiti Playa sits opposite a beach in Northern Spain. The city of Barcelona is about an hour away. Guests can enjoy countless leisure and cultural activities, including visits to the Sagrada Familia and Park Güell, the MACBA or the Aquarium. The Illa Fantástica Water Park is about 40 minutes away, Marineland is 15 minutes away, and Water World Lloret is half an hour away by car. 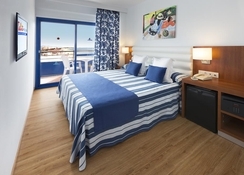 The guestrooms at Hotel Tahiti Playa, renovated in 2017 (they were part of an apartment complex) are bright and spacious spaces and can easily accommodate three people. Guests can enjoy air-conditioned spaces and a private bathroom equipped with a hairdryer and towels. A terrace, flat-screen TVs with satellite channels, a minibar and a safe are the other amenities offered by these marine-style guestrooms. Some of the rooms offer magnificent views of the sea. The hotel has a lounge bar and a cafeteria. The restaurant offers a buffet menu where you can taste Catalan, Spanish and also from other parts of the world. 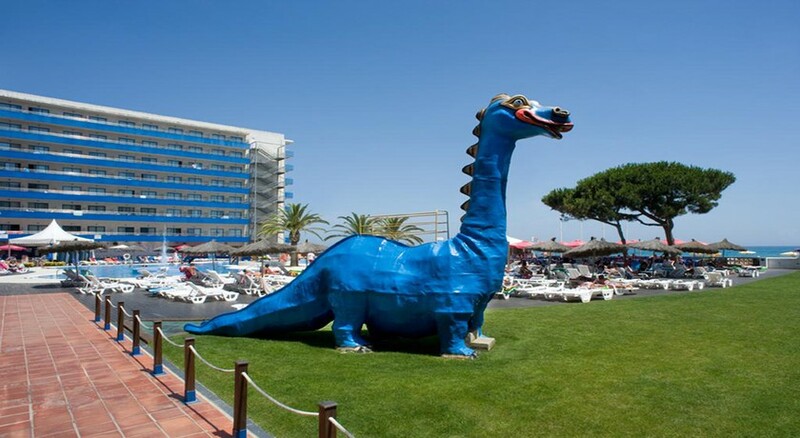 Hotel Tahiti Playa - located next to the beach offers an extensive swimming pool shaped like a lake, with a children's area and an outdoor Jacuzzi. It also has a hammock and umbrella area. There’s a ‘kids club’ where children can enjoy fun activities planned by the hotel staff. Guests can also enjoy musical performances and dance sessions. The hotel’s spa offers relaxing massages and hairdressing services. For a four star the food was poor stayed at Santa susanna which was 3 star before and food was great. Our room was lovely but only because we had to pay an extra 200 euros to upgrade so it worked out a really expensive holiday. We love this place, no real faults, clean and tidy, friendly staff, excellent location, very good value for money. Will be visiting again. Great hotel, stayed half board, plenty of choice of fresh foods, clean pool area right on the beach. Selection on bars along the main strip however as went the end of October it was out of season so not much open. Close to other resorts Blaines, Lloret de mar etc within 10- 15 minute drive in car. 1 hours drive from Barcelona by car however there are coach and train links. Had a great time away. Had a great time away. Friendly staff. Clean facilities and loved the fact the beach was right beside the hotel and accessible through the hotel.